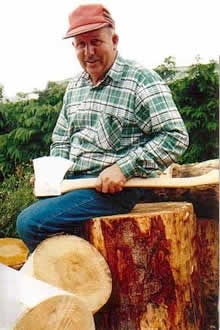 [caption id="attachment_1710" align="aligncenter" width="220"] Tuatahi Racing Axes & Saws founder Eddie Fawcett with one of the Masterton company's world-beating products[/caption]Whether to outsource or insource, that is (one of) the questions. For axe and saw maker Tuatahi Racing Axes & Saws, the question resolved itself a number of years ago says its office manager, Jo Fawcett. The 45 year old company, started in Masterton by her father Eddie who as a competitive axeman was originally asked by others to sharpen their blades, and then to make the finished product, used to get others to carry out the forging component of making the axe head. “But we found that some of our axes were bending and breaking,” she says. The company made the decision to bring this forging side back and also bought the power-hammer required to form the axehead. Tuatahi orders 25 tonnes of the specialty steel at a time in 3 – 5 metre lengths. A five kilo block of this is in turn crafted into an axehead. As well as the racing axes and saws, Tuatahi is also looking to expand its working implements side of the business. Racing axes and saws currently make up about 60% of the company’s almost $1 million a year turnover. In this regard Jo Fawcett notes two particular trends. The USA’s Obama administration has opened up more heritage trail areas in America’s forested areas. The US Forest Service only allows hand held equipment to be used in clearing and maintaining these trails, and Tuatahi’s M-tooth and Peg and Raker Work saws are the preferred implement for these gangs. The greenie movement and a bit of a back to basics wish among some foresters and farmers is also seeing the revitalisation of interest in using hand axes and saws instead of chainsaws. From a business point of view, Tuatahi is looking to become more streamlined. This should help reduce the axes and saw waiting times (for orders) and enable Tuatahi to have actual stock implements on its shelves. “That would allow us to go down a completely different path, instead of chasing our tail all the time,” Fawcett says. One new market would be firefighters’ axes, which the company hasn’t yet had the time to investigate properly. Automation of some of its processes, particularly to produce the $295 work axes is something that Tuatahi would like to develop. Having had a limited success with a prototype machine to help grind the teeth of its racing saws means that the company knows it has a challenge to replicate some of the handmade operations. Original generation time 1.7902 seconds. Cache Loaded in: 0.0135 seconds.